CSI provides shelving for almost any application. 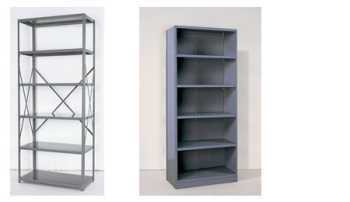 Stockroom shelving is typically steel shelving. Wide-span shelving is typically considered warehouse shelving racks. Rivet shelving is typically used in distribution and record storage environments. Wire shelving is typically used for medical and clean environments. All of these industrial shelving types are versatile, easy to install, highly configurable, and strong. Our professional personnel can assist you with selection, layout, and configuration based upon your unique application. CSI provides steel, rivet, wide-span, and wire shelving. If you do not see specifically what you are looking for Contact Us, we are here to assist you. Request a quote and put our professional personnel to work for you or Contact Us for more information about our industrial shelving.